The Rockets were respectable enough, making the playoffs five times in his nine years. But they were expected to be better than respectable; when Yao was paired with Tracy McGrady, Houston fans hoped their dynamic duo could challenge the NBA's elite. 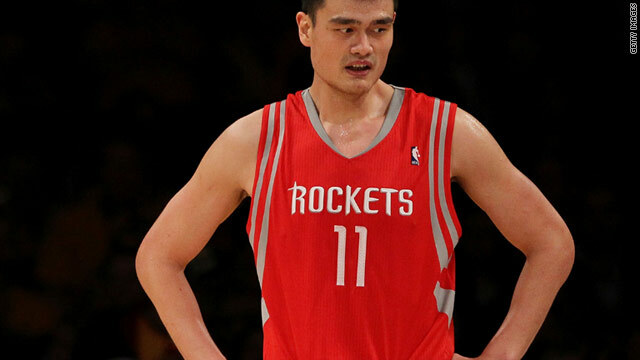 Instead, Yao's Rockets advanced to the second round just once, losing four times in the first round. Injuries undoubtedly held Yao back. It felt like every time he'd elevate his game, another injury would strike him down. In the last two seasons, he played just five games out of a possible 164. And when he returned, it was to a different NBA. A combination of rule tweaks plus a simple lack of talented big men shifted basketball's focus away from centers to smaller, faster guys. Yao's rare set of skills were still valuable, but not nearly as important as they would have been in previous years. Despite the setbacks, Yao remained popular. Thanks in part to votes from China, Yao often led NBA All-Star voting. His humor and ability to defuse potential controversies - like his response to Shaq's "ching chong" comments - won him fans in the U.S. And then there was his Apple ad. But players aren't defined by their media savvy; their legacy rests on what they win on the court. And injuries robbed Yao of his chance to show what he could really do. There is a sad coincidence here: Should he indeed retire this summer, Yao Ming will leave the NBA at the same time as the man he was supposed to supplant at the game's summit. Shaquille O’Neal retired in June after 19 years in the league. Yao Ming lasted just nine. It is a shame to see him go. I have to agree with you, he had a lot of potential, but it never came to fruition. Yao represented what all NBA players should aspire to. A selfless, talented athlete always gracious and always playing as hard as he could. wow, such a downer article for someone who broke barriers and played in the NBA for 9 years. I think he did great things for the game, way better than a lot of the hoodlum/gangster image of some players, and he inspired an entire generation of Chinese players. Well done, Yao! 'Yao could have been was the NBA’s next great center.' It sounds like the writer was arguing within himself on this one..
What kind of Journalism is this? He has a nice restaurant. This is so true. We will never know what could have been. He was fun to watch but every time he was ready to break out, he would get hurt. There was a lot of positive and he accomplished alot. However, we will never what it could have been? He also, came out strongly against shark fin soup, which is considered a delicacy of the rich in China, which is also putting sharks on the verge of extinction. His position was not popular in China. Always liked him, but this made me like him and respect him even more. "Yao Ming lasted just nine." I think it is premature to suggest he is done and will retire unless you have an inside source. Yao is a fighter and a very determined individual. I can't imagine his injuries being any worst than Greg Oden's who also will be back when he can. Just call me Mr. Optimistic! One other issue the article didn't bring up was his having to play back in China from time to time. Almost zero off season couldn't have helped his injuries. He was a good guy and he got a chance few do. He's a success, but yeah he could have been better. It wasn't in cards though. Shaq got to rest his body each offseason, China didn't let Yao rest. They had him playing basketball year round. It's a shame that he has to retire so early, and with more downtime he wouldn't have had to. Sad story due in part because Yao was a "good guy". No alterior motives to his character. He played the game because he loved it, and there were no personal distractions other than his injury. He had a positive impact of the game on and off the floor. He made his countryman proud. He showed that you can pactually play sports and retain your principles of integrity, honesty, and good morales. HIs down fall wasn't greed, it wasn't self absortion of ones self, nor did he need to be the center of attention. He was the flip side of James. If only there were more like him. Sad that it takes someone from another country to show us here in USA what a decent human being looks and acts like. A person with self respect, who respects the opportunity he was given, an appreciation of what the game has given to him, appreciation of fan support. Not some self indulgent me, me, me self promoting jerk. Take note James, then you just might get the love back that you so desperately want. But I would venture that a 7′ 1″ big man (still tlpney tall) with his shooting touch, basketball IQ, and improved quickness would have been able to still average that, if not more. You know what would have been scary: a 7 footer with Yao’s skills who could really move around the court… and was able to actually stay on it. Yea, I think that pretty much sums up the last great Rockets center before Yao . . . Hakeem The Dream. Really tall people tend to have bad backs and sore feet. There's a break-even point beyond which height is a handicap. i would rather yao took two or three years off to heal, practice and rest, than retire to pasture. better to have a late career than no career. He sucked. End of debate. I am glad to see him go. Thi sloser is voted in every Alll Star game and never played in the season. Just like the rest of cheap stuff "Made in China". yeah but Shwaq was in the league 10 years too long and had to rely on Kobe to prove his worth. Yao > Shakkkk any day. He was a great player, I suppose. I remember being 12 years old when he entered the NBA and there was SO much hype around this guy. You would think that he would totally dominate the sport. But he didn't. Everything the author said was valid. Get over it! Yao Ming's NBA career is dead, gone, zilch- he's Michael Jackson baby. Yao I love you,no matter which way you choose!!!!! well actually Yao's injury has made him unavailable for long. Maybe to our sadness ,but his retirement is a relief for his ankle. Yao was a pretty good player when he wasn't injured. Notice a lot of people on here either overrate or underrate his career. But hey, he was for the most part above league average for a center, and managed to stay in the NBA for about six full seasons. Most guys don't even stay in the league enough for a cup of joe. I say forget about the woulda coulda shouldas. He was what he was. Leave it at that. to michael martin, all the hype came from y0ur western media. this is a great example of a perosn who really appreciate the human life, not only suspend his games in the NBA, also help to his country after this terrible disaster.